Greatly appreciating the Government of Myanmar’s partnership with the International Centre for Integrated Mountain Development (ICIMOD), Minister U Win Tun of Ministry of Environmental Conservation and Forestry (MoECAF) said time has never been more opportune to intensify the collaboration further. Minister U Win Tun, who was the guest of honor at the Myanmar-ICIMOD Day on 25 March 2015 in Nay Pyi Taw, said as Myanmar seeks to make significant gains on its seven priority areas which includes the development of agriculture and tourism sectors, cooperation with regional and international partners is critical. “Today’s event, Myanmar-ICIMOD Day, reflects one of our international collaborations to fulfil our endeavor, determination, and commitment to conserve biodiversity and ecosystem services as well as to support development and climate change mitigation,” he said. The minister pointed out that approximately 42% of Myanmar is mountainous, and many mountain-specific issues transcend local and national boundaries requiring a broad regional approach and transboundary collaboration to find effective solutions. “In this context, collaboration with ICIMOD provides a great opportunity to strengthen our efforts on sustainability of mountain environment as well as to address problems facing the mountain areas, which are mostly transboundary in nature,” he said. Myanmar is a founding member of ICIMOD and has been instrumental in supporting the Centre’s mission and vision. The Ministry of Environmental Conservation and Forestry is the nodal ministry and the Department of Forest represents Myanmar in ICIMOD’s Board of Governors. The purpose of the Myanmar-ICIMOD Day is to provide a platform for mutual learning, sharing, and networking opportunities among the national partners and to showcase works of ICIMOD’s partners in Myanmar for increased ownership and visibility. The event also provides the government partners to give an overview of their ongoing activities. Dr David Molden pointed out that ICIMOD has been expanding its activities in Myanmar in the recent years. The Government of Myanmar hosted the annual Board Meeting in 2012 where ICIMOD’s Strategic Framework and the Medium Term Action Plan were endorsed. Today, there are five major programmes of cooperation between ICIMOD and Myanmar. These include: Landscape Initiative for Far-Eastern Himalayas (Hi-LIFE Initiative), Rural Livelihoods and Climate Change Adaptation in the Himalayas (Himalica), Livelihoods and Ecosystem Services in the Himalayas (AdaptHimal), REDD+, and capacity building on remote sensing. In addition, ICIMOD also supported the development of Myanmar Ecotourism Policy and Management Strategy. Outlining the purpose of organizing the Myanmar-ICIMOD Day, ICIMOD’s Director of Strategic Cooperation Basanta Shrestha said partnership is key to ICIMOD to reach its impact on the ground. “We want to strengthen existing partnerships and build new ones in order to synergize our efforts to raise the voice of mountain people given that mountains are often marginalized,” he said. Director Basanta Shrestha added that the intensity of programmes in Myanmar is growing, and synergy among partners must be developed at multiple levels recognizing the many actors. 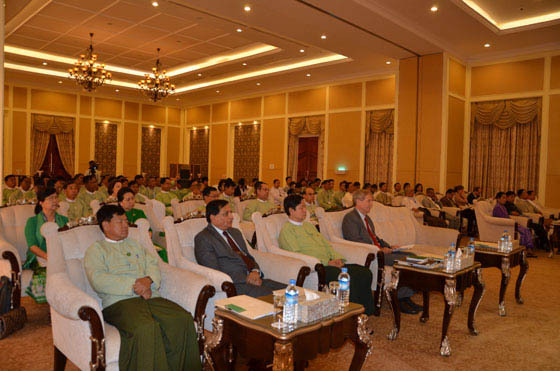 Equally important, he said, is to address cross-linkages with different agencies in Myanmar. 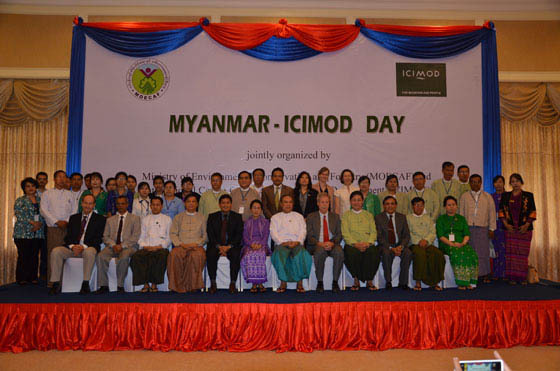 The Myanmar-ICIMOD Day was preceded by a half-day programme in Yangon that brought together diverse non-government actors like NGOs, development partners, and the private sector. With the theme ‘Introducing ICIMOD: Strengthening Partnerships in Myanmar’, the programme on 24 March at the Park Royal Hotel was attended by the ambassadors of ICIMOD member countries like India and Pakistan; representatives of development agencies like UNDP, UN-Habitat, and the European Union; non-government actors like EcoDev, Centre for People and Forest, and Myanmar Institute for Integrated Development; and private sector agencies like the Myanmar Tourism Federation and the Union of Myanmar Federation of Chambers of Commerce and Industry.